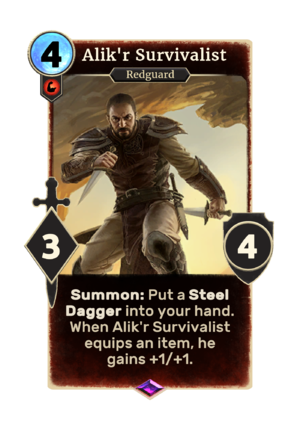 Alik'r Survivalist is an epic Strength creature card. It is part of the Core Set. "Give me a blade and a soft throat!" "Swift as the desert wind." "Only one of us shall survive." This card was previously part of the training mechanic where it could be upgraded from Alik'r Bandit at level 19. This card's equip ability applies the Will to Survive card effect. The card is named for the Hammerfell region of the Alik'r.